This is a conversation I have been wanting to have. For weeks, actually. Why conscious cairns? Because I have come to realize that the significance of cairns depends entirely upon context. On mountain sides, they tend to signify the direction to follow when a trail is unclear, as across sheer rock. When constructed within a clearly marked circle, they are more likely to hold ritual significance. 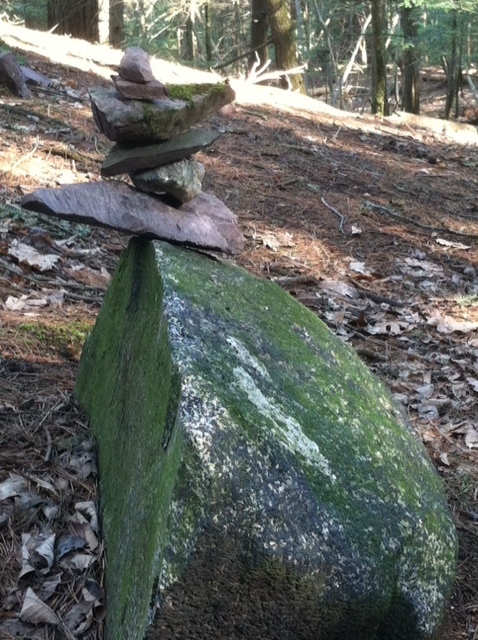 But the cairn constructed along woodland trails or in open meadows would most likely be an act of art. Which is what brings me to conscious conversation about them. At Red Rocks, a woodland park in downtown Burlington, VT, where I daily walk with my cherished canine companion, I have taken to observing the ups and downs of several cairns. By which I literally mean, that one day a beautiful cairn is up, carefully constructed with artful balance baffling the eye while challenging gravity. The next day, it is gone. Not merely fallen down; but carefully dismantled, its component stones scattered or buried in an apparent attempt to undo any memory of its prior existence. I dwell on this because, while there are clearly people like myself who enjoy both building and contemplating inventively piled stones, it seems there might also be those who feel, for whatever reason(s), somehow threatened by them. At least, this is the conclusion I have reached, short of issuing a questionnaire to walkers in the park. A thought I did, at least fleetingly, consider, being of curious constitution myself. Instead, I patiently re-build the three cairns I have taken personal interest in when they are down. I carry on conversations with my imagined source of their destruction. I marvel at the additional creative ways others have placed mossy stones within decayed trunks; piled and bridged flat stones to create a waterfall effect; worked stone, branch and birch bark into complex sculptures that celebrate the interaction of human creativity with found natural objects. They feel to me like celebrations of life. Clearly they have been created with conscious intent – if not to guide our way, then to invite us to stop and contemplate a while. Like Tom Woodman, in his short “Zen and the Art of Cairns,” I could sense that someone had shaped the environment through piling stones in certain ways and my appreciation of the landscape was richer because of that. I do not need to understand the particular message behind such an action of conscious creation in order to appreciate it. This entry was posted in con fem fridays, personal and tagged appreciating landscape, celebration, conscous conversation, creativity, the art of cairns by sarahwbartlett. Bookmark the permalink. Interesting conversation! I wonder though whether there are more benign interpretations of the motives behind dismantling. I am not a builder or dismantler of cairns but I do thoroughly enjoy encountering them and, often, recording them in pixels. For some reason I have been drawn to ephemeral outdoor art for a long time. I have books and books of pictures of the works of Andy Goldsworthy, for example. I think, for me,the ephemerality of these works is a large part of their appeal and their beauty. So I do wonder whether the dismantling of them is actually part of the art? At the same time it frees materials for new art,preferably to be used to create something not exactly the same as the old art. Thus the art is living and constantly evolving, like the natural environment that produced the materials and provides the stage. Thanks, Rachael, for stopping and for your comment. I’d agree that the leveling of one woman’s cairn to make way for another could be part of the experience.There certainly are places along this woodland path where rock towers shift, change components, feel like living sculpture. What I’ve noticed increasingly, however, is something less subtle, in which the stones that were a cairn yesterday have been scattered today. I’m talking often at some distance from the original site; as if to do so would prevent another being constructed. And BTW I, too, am a huge fan of Goldsworthy’s creations. Love your concept of the living/evolving art ‘like the natural environment that produced the materials and provides the stage.’ Yes!!! Might be hard to believe but once our 3 year old son found out what cairns were for, he wanted to build them too. So whenever we go for a hike, he likes to make his own cairn somewhere on the trail. I agree, Peter – ‘I was here’ feels right. It’s also becoming an art form, based on the number and apparent attention to detail of some. True balancing acts! I’m about to post a poll to see what others think (thanks to WP ‘contact form’ prompt!!) And I totally believe your son builds cairns; at that age, mine was building all kinds of things. You might have an engineer in the making! I’d be curious to hear the results of attempting to engage the cairn dismantlers in dialogue via notes left in ziploc bags (or similar) to better understand the values and possible fears that have led to this rocky conversation. I’ll give it a try . . . 🙂 Thanks for the suggestion.